First, there were self-driving cars. Next up, self-driving motorcycles. BMW Motorrad, the motorcycle division of the German automobile company, presented its first self-driving, riderless motorcycle at the BMW Motorrad Techday 2018 at Miramas, France. 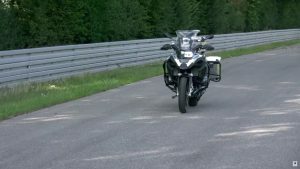 The autonomous BMW R1200GS showed its magic by taking its first rounds. Developed by graduate engineer Stefan Hans and his team, the vehicle independently drives off, leans into turns, and even deploys the kickstand as it comes to a stop.